It is estimated that almost 1.6 billion people on this planet live without electricity. To have light in the darkness, toxic fuels like kerosene are used to fuel lanterns. While they provide much needed light, they also pollute habitats and endanger the health of those living inside. 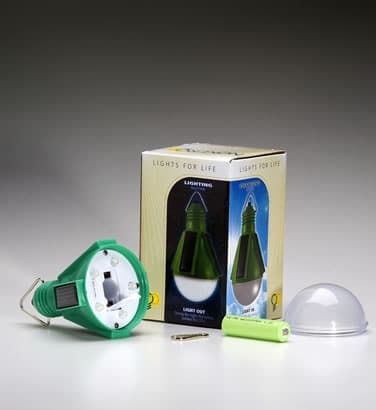 A Denver inventor, Stephen Katsaros, appropriately named the solar light he developed Nokero, short for “no kerosene.” The solar battery powered LED-type solar-powered bulb measures 70mm by 125mm and emits light for two to four hours, depending on the charge. Such a clean, low-cost technology might eventually make lighting fuel like kerosene obsolete. The Nokero website states that 5 percent of the average user’s income is spent of fuel for lighting. The price of a Nokero bulb and charger package is $15. The story about this innovation has been featured on National Geographic and Denver television station, KCNC-4 , among a growing list of interested media. The Nokero bulb is being manufactured in Hong Kong, under the business heading, Nokero International, LTD. According to Nokero’s website, this manufacturing base allows the company to deliver “the world’s only solar powered light bulb at a quality and price point that can not be met by traditional manufacturers / distributors. On its website, its mission reads, “Nokero’s vision is to provide solar light bulbs to replace kerosene lanterns used throughout the world. We work with dealers, non-governmental organizations (NGO), donors, and proactive groups around the world to make this vision a reality. The inventor, Stephen Katsaros, says his career has been centered around innovation—ranging from product development to intellectual property. He holds a Bachelors of Science Mechanical Engineering (BSME) from Purdue University (1996) and was a non-degree seeking student at the Bard Center of Entrepreneurship at the University of Colorado, 1998-1999. He received a B.F. Goodrich Collegiate Inventors Award in 1995.